Located in the beautiful Brittany region of north-western France, Pentrez La Baie de Douarnenez makes for beautiful holidays. 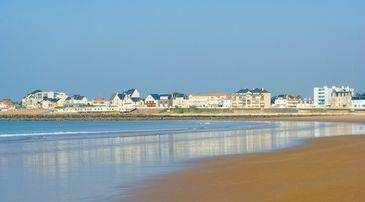 There is plenty to do in this secluded and relaxing town, with the soft sands of the beach ideal for relaxing as well as a range of water sports on offer. With a fascinating history shrouded in mystery and delicious produce, this is also the ideal place for lovers of culture. Enjoy a relaxing and tranquil holiday in Brittany, with beaches and natural surroundings galore in Pentrez La Baie de Douarnenez. Madame Vacances offers accommodation to fit in with the surroundings in the Pentrez La Baie de Douarnenez. Relax, unwind and make yourself at home, with facilities to suit families, couples and groups alike. Guests can make the most of the many attractions in the nearby area, with easy access to the incredible landscapes as well as the soft sands of the nearby beaches. 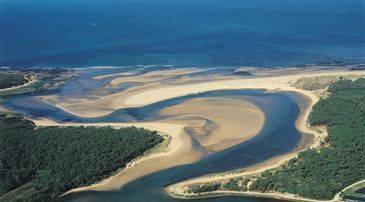 The beautiful sandy beach is the main attraction on a holiday in Pentrez La Baie de Douarnenez. Stretching out for miles, and home to sun loungers and parasols to rent, this is the ideal place for those wanting to simply relax, unwind and make the most of the warm French sunshine in the summer months. The sands gently shelve into the sea, making it ideal for those with younger children, while the cross-Atlantic breezes make it perfect for those wanting to try some of the water sports available here. 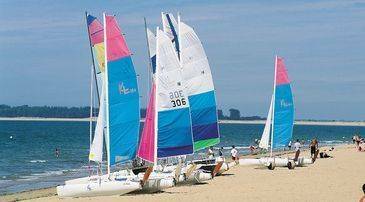 Choose from sand yachting, which includes sitting in a bicycle-like structure attached to a sail, surfing, sailing, paragliding and more during your stay. Saint Nic is the main beach area of Pentrez La Baie de Douarnenez and is the starting point for many of the stunning coastal walks the area is so favoured for. Hike over the sands, along cliffs and through pretty rural villages before stopping off for a picnic with panoramic views over the Atlantic or surrounding countryside. Keen cyclists will also find plenty of trails to keep them occupied, and there are a few options for bicycle rental in the town itself. The Crozon Peninsula is ideal for those wanting to explore, while the foothills of Menez Hom are another must on a holiday in this pretty area. Those wanting to soak up the history and culture of the area will find plenty on offer on their holiday in Pentrez La Baie de Douarnenez. Coming to prosperity in the 19th Century through its sardine exportation, this town in filled with historical buildings, sites and attractions. Religious history lines the streets, with Chapel Saint Damien, the Chapel Saint Como and the Saint Nicaise Church all dating back hundreds of years and offering an insight into the interesting history of the area. Alternatively, simply wander through the streets of the town, taking in the ambience and stopping off in one of the little cafés, bars and restaurants along the way. The maritime museum in Pentrez La Baie de Douarnenez is worth a visit for an hour or two, and will immerse you in the interesting history of the region. Called the Port Musée and found next to the town's oldest of four harbours, there are five boats to explore here. Explore a traditional lobster boat, a freighter, barge, Norwegian coaster and a British tug boat before wandering through the harbour and admiring the pretty boats and views out over the sea. For a day spend exploring and soaking up the relaxing atmosphere guests should take a boat over to the Isle of Tristan, which is best seen at low tide. Wander through botanical gardens, admire the princess' house, and hire a guide to take you on a tour of the remains of the island. If you prefer to explore on your own there are also pretty orchards on the island, ideal for a picnic with the whole family. Pentrez La Baie de Douarnenez is located in the Brittany region of France and offers guests a delicious taste of the local cuisine. Here there are freshly caught seafood dishes, with delicious mussels, prawns, langoustine, crab, lobster and more to tempt you. Try clams and winkles on a fruit de mer platter, as the area is an ideal place to catch them. Home to famous French crêpes, indulge with creamy cheeses in galettes or sweeten them up with lemon and sugar, or banana and Nutella. And no visit to France would be complete without savouring a delicate pastry or cake from the local bakery. Galettes au Buerre are a delicious butter biscuit local to the region, while Kouign Aman is made with caramelised pastry and butter. A very popular restaurant in Pentrez La Baie de Douarnenez is the Bar de la Mer, which offers a range of delicious seafood options, with fine wines from the area served by friendly and helpful staff. Those wanting to enjoy a self-catered holiday will also find a fruit and vegetable market above the beach every morning. A local butcher and baker also visits the town every Thursday morning throughout the year, while the nearest supermarket is 5km away. There is very little wild nightlife in the town, but for a relaxed drink al fresco, you can't go far wrong with the local bars and restaurants. There is a Kids' Club, Club Heavies, for younger children, which stays open throughout the summer season in July and August. It welcomes children from the ages of 4 to 12 years and will keep them occupied throughout the day, with water sports, activities, games and fun on offer, as well as the chance for them to make some new friends. Most of the parking in Pentrez La Baie de Douarnenez is free, with limited parking spaces available as the town is small. Most accommodation and hotels do offer free parking to guests, with many UK visitors choosing to bring their own car on the ferry and driving from Cherbourg or St Malo.